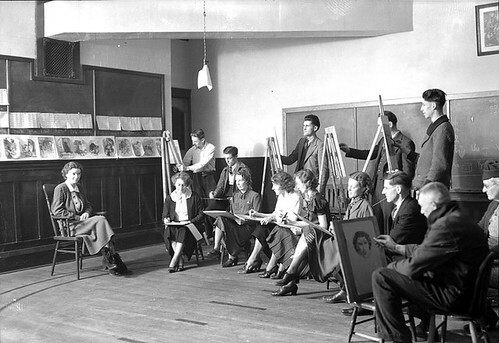 A drawing class, possibly at Central School in Lethbridge, 1930s. Courtesy of the Galt Museum and Archives on The Commons. I believe I have quoted Americans for the Arts’ Marete Wester in the past, who wrote in this post for ARTSblog that being an art education advocate requires the temperament of a manic-depressive optimist. Indeed, when writing my posts for Art Advocado each week I often feel like a bit of a Debbie Downer. But it’s not all bad news in the world of art education. The good news is there, you just have to dig a little. So! In celebration of the end of another school year (at least in most areas—I know some of you who had a rough winter might be in school right up to July!) I am rounding up some inspiring and positive news from the world of art education. The hard work of art teachers and their students may go unnoticed by the front pages of the New York Times, but not so here at Art Advocado! Congratulations to Hinsdale, Illinois art teacher Theresa McGee! McGee, who is also a SchoolArts columnist, was honored with a PBS Teachers Innovation award for her use of technology and public media in her art room. This interview with Theresa has more information on the award and her teaching techniques. (Spoiler alert: her great uncle invented Sesame Street’s mathematician vampire, the Count!) ****UPDATE: Theresa's great uncle took part in the development but was not the sole inventor. Apologies for the confusion, Theresa! Here’s a lovely interview with Germantown, MD art teacher Peter Plant. Plant talks about the challenge of being an art teacher and what his students are learning both within and outside the realm of art. Rome, Georgia residents honored their longtime art teacher with a celebratory exhibition. The show featured the work of Chris Hodges, who is retiring after 21 years of teaching, as well as artwork by his students over the years. Newberry, Florida city commissioners and historic preservationists partnered with art classes to help drum up interest in the city’s historic district. Fourth grade students drew historic buildings while high schoolers created plans for the future of Newberry; the works are now displayed together at a public exhibition. On the left coast, the Oregon Red Cross is exhibiting student artwork inspired by the tsunami in Japan earlier this year. The idea was born out of one Red Cross employee’s desire to memorialize the tragic event, and to educate area youth about disaster preparedness. The Art of Disaster: Views on the Japanese Earthquake is on view at Portland's Red Cross building through August. Cheers to all of you, and to your colleagues across the country who work tirelessly to keep art in our schools. Hip hip hooray! Do any of you have success stories about your own art classes? Leave them in the comments!